Today I’m going to be completely honest with you, because it’s something many people need to hear. I don’t care how much your blog is making or who told this to you (even if it was me), your blog is not a business. Not at all. So quit calling it one! Note: This post is outdated, and the book mentioned is no longer available. Instead, it has been drastically expanded upon, and is now part of my blogging course, which you can view by clicking here! I’ve kept this post for historical purposes only. We all reach that point in our lives where we are incredibly busy. The point where we have to put certain things on hold for a while. Unfortunately, that time has come to me for the past few months, and I was unable to work on one of my favorite web sites – this one. Having just started college, I was completely overwhelmed with the amount of extra work I’d have for me. While I’m taking all of the online classes I can, the amount of studying I must do to succeed is proving to be quite the challenge. However, I couldn’t tame my passion for blogging, so I decided to take up a new challenge – writing a book. And guess what? It’s done! 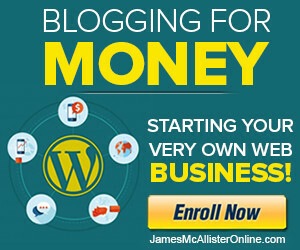 Blogging For Profit: A Beginner’s Guide To Starting Your Very Own Web Business! will be available on Amazon’s Kindle store and the Google Play store later this week. Through writing this book, I’ve gained invaluable experience that I can’t wait to share with you. I’m a better writer and a better blogger as a result. Fortunately, times are clearing up and I’ll be able to return to working on Help Start My Site Again. There are also some other changes coming to the website that I think you will love. You’ll see them when they happen :). Thanks for your understanding and I look forward to getting back to regular schedule! I’m constantly striving to make HelpStartMySite.com the best resource to you all that it can possibly be, which is why I’m pleased to announce that there will be several upcoming changes to Help Start My Site within the upcoming weeks. First and foremost, I’m looking to up the posting schedule from 1-2 posts a week to 3-4 posts a week. Now that I’m out of school, I have much more free time to dedicate towards writing content to publish while also having additional time to market the new content. This means more great articles for you to read! Secondly, I’m going to begin selling my services by allowing the ability to hire me for various tasks. This will range from consulting to full-on custom programming. Prices will only get more expensive as the demand for my services increases, so it’s highly recommended to purchase early if these services interest you. Of course, if you’re already signed up to my email newsletter, you’ll be the first to know and will be eligible for subscriber discounts. Finally, I’m going to be tweaking the design a bit within the next few weeks. I’m a bit dissatisfied with the blandness of the website, and would like to make it a little more colorful. I’m also going to have a custom logo made as I’ve been putting it off for far too long, and it’s time to change that. Anyway, I look forward to seeing how it all plays out and I hope you’re as excited for the changes as I am!